Spring is all about the Flowers and so is this challenge! Found objects were a button and a butterfly sequin. Found objects were a license plate charm and a button. Found objects were a button and a pearl beaded ornament. Found objects were a puzzle piece and a yellow pipe cleaner. Found objects were a pink feather and a wooden star. Found objects were a piece of green rick rack and a felted wool blob. Found objects were a wooden star and a pipe cleaner. Found objects were a wooden star and a button. Found objects were a piece of red rick rack and a wooden star. Found objects were a metallic red pipe cleaner and a felted wool blob. Found objects were a puzzle piece and a key. 1. All items in the seed packet must be used and be recognizable in the project. 2. 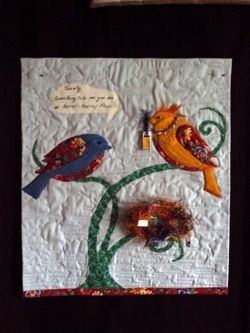 You may use other fabrics and/or fibers with those given to you in the seed packet. 3. Project must have a perimeter of 120" or less. 4. One project per seed packet. You may submit more than one project, but you must purchase a seed packet for each project. 5. 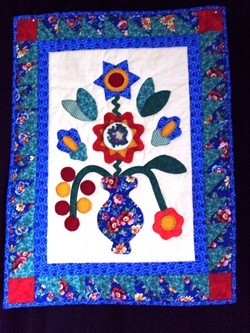 All projects must be returned to Quiltessentials or Anita’s Homespun Treasures by 3pm on Saturday, April 30th. 6. 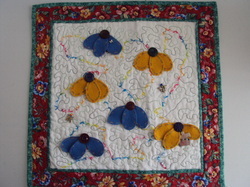 All projects will hang at Quiltessentials and Anita’s Homespun Treasures for two weeks. You will be able to pick up your project beginning Wednesday, May 18th. 7. Voting will be based on Viewer’s Choice. Viewer’s will vote using pennies. There will be a first place and second place prize. The pennies will be donated to the Happy Scrapper’s Quilt Guild and the Quilter’s Night Out Quilt Guild for the making of their charity quilts. 8. 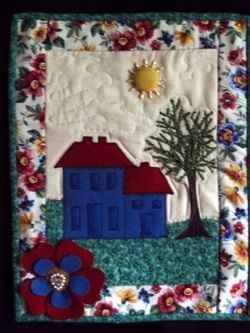 First place prize is a $30 gift certificate ($15 from Quiltessentials & $15 from Anita’s Homespun Treasures). 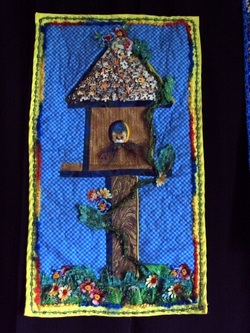 Second place prize is a $20 gift certificate ($10 from Quiltessentials and $10 from Anita’s Homespun Treasures).